Scientists at Nanyang Technological University (NTU Singapore) have invented a new type of nanofilter that could reduce the energy needed to treat wastewater by up to five times. Typically, for the last steps of water purification in a wastewater treatment process, an ultrafiltration (UF) membrane filters out small particles before a reverse osmosis (RO) membrane is used. In reverse osmosis, water is pushed through an extremely fine membrane at high pressure to separate water molecules from any remaining contaminants which are tiny – about a thousand times smaller than the width of a human hair, such as salt, heavy metals and toxic chemicals like benzene. This high water pressure, typically 10 bars and above, means that the water pumps need a lot of energy. However, NTU’s proprietary nanofiltration (NF) hollow fibre membrane does away with both ultrafiltration and reverse osmosis, combining the two processes. It also requires only 2 bars of water pressure, similar to the pressure found in a typical home pressure cooker, to filter out the same type of contaminants. Yet it produces water that is almost as pure as through reverse osmosis. This breakthrough technology took NTU's Nanyang Environment and Water Research Institute (NEWRI) about two years to develop and is now being commercialised by an NTU spin-off company De.Mem. De.Mem which owns over a dozen water treatment plants in Vietnam and Singapore, will be building a pilot production plant in Singapore to manufacture the new membranes. NTU Professor Ng Wun Jern, the executive director of NEWRI, said the new technology marks yet another huge step forward for Singapore, as it will be the first of its kind to hit the market. “With the increasing urbanisation of cities and fast growing global population, more cities and communities will face an unprecedented challenge to meet its growing demand for clean water and wastewater treatment,” Prof Ng said. 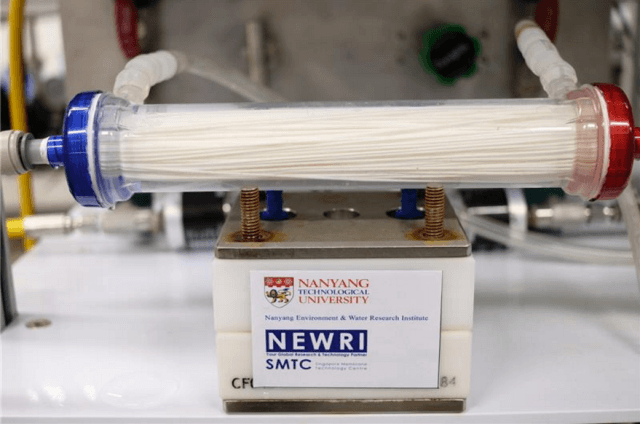 NTU Professor Wang Rong, the director of NEWRI’s Singapore Membrane Technology Centre who led the team in designing the new NF membrane, said they had designed it for commercial scale-up and production. “One of the main challenges faced by the industry is that current reverse osmosis processes are energy intensive, with down time needed for maintenance,” explained Prof Wang, who is also the Chair of NTU’s School of Civil and Environmental Engineering. Mr Andreas Kroell, Chief Executive Officer of De.Mem said the new membrane fills a gap in the current market for water treatment solutions. “We have seen in the labs that when we treat industrial wastewater with the new nanofiltration membranes, the quality of clean water produced is comparable to reverse osmosis but requires much lower pressure, hence lowering costs,” Mr Kroell said. De.Mem will test the new membrane modules in real world usage in its plants to verify its effectiveness and efficiency before scaling up to a full industrial production line. NTU’s new membrane technology will also be showcased at the upcoming Singapore International Water Week, from 10 to 14 July.